In the spring of 1996, Susan and I were living on a small farm in the Ozarks in northwest Arkansas. We were trying to find a use for our farm that would justify having the 120 acres we had purchased. Since it was not enough land for a standard cattle operation, we began to consider some type of exotic livestock. I knew I did not want an animal that would spit at me and I was not interested in a bird that was taller than I was. I also knew that my age and physical condition was not conducive to wrestling the large livestock that you find on the market today. About this time, we noticed an article from the Point of Rocks Ranch in Ft. Davis, TX regarding the Miniature Herefords. Our excitement mounted as we began to explore the possibility of raising miniature cows. Farm and livestock were something that we had both grown up with and this seemed to fit the bill for what we envisioned for our farm. After putting our goals on paper, we began to look for the smallest registered Herefords that we could find. We also decided to limit our search to polled Herefords. Our search led us to a herd that had been closed since the late 50's or early 60's. 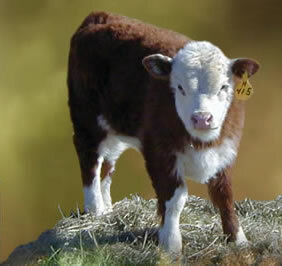 We purchased eleven 2-year old heifers that ranged in size from 44" to 48" at maturity. We then contacted the Point of Rocks Ranch requesting the use of a miniature bull from their herd to breed our cows for a specified fee. In the years since 1996, we have built a herd of approximately 60 cows and heifers ranging from frame size 00 to frame size 1, and we have bulls as small as frame size 000. Our message is to those of you who, like us, have more time than money. You can get into the miniature cattle business quickly if you can purchase the small cattle to begin with and save yourself a lot of time. If your finances do not allow this, you don't have to give up a great opportunity. Just contact us for the programs that are available to you.